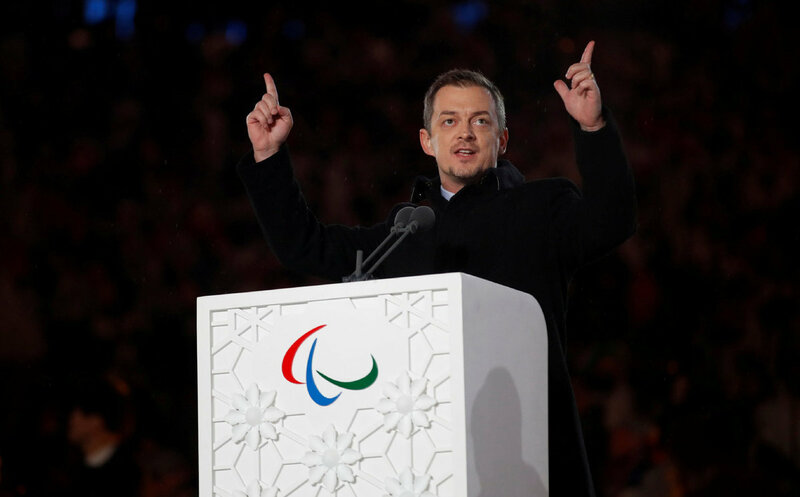 President of the International Paralympic Committee Andrew Parsons speaks during the closing ceremony of Pyeongchang 2018 Winter Paralympics, South Korea, March 18, 2018. Russia was reinstated by the International Paralympic Committee on Friday after a suspension of more than two years for widespread doping. The IPC ruled reforms in Russian sport to crack down on doping and limit government interference are enough to allow the country to compete under its own flag ahead of the 2020 Paralympics in Tokyo. The committee has given up on a demand that Russian authorities should admit to the findings of a report by World Anti-Doping Agency investigator Richard McLaren which led to the Russian Paralympic Committee's suspension in August 2016. The IPC will monitor Russian Paralympic affairs through at least 2022 and could immediately re-suspend the country if it breaches conditions to be unveiled next month. Those will include an automatic suspension if WADA decides Russia's national anti-doping agency doesn't meet international rules. "I think the Paralympic movement and para-athlete community are now ready to welcome the RPC and Russian para-athletes back into the fold," Parsons said. "They should be under no illusions, however, that their every action going forward will be heavily scrutinized, not just by the IPC and other para-athletes, but by the entire world." Russia was completely barred from the 2016 Paralympics in Rio de Janeiro, though 30 athletes from the country were allowed to enter as "Neutral Paralympic Athletes" for last year's Winter Paralympics in Pyeongchang, South Korea.